The Donor Pages App lets you accept online donations through a personalized donation webpage. 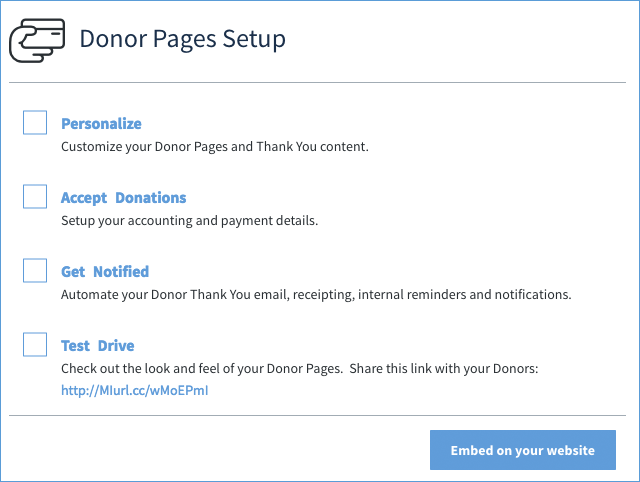 There are a number of steps to set up your Donor Page, and this article will go through the different setup sections, starting with the Personalize section. To start off the setup, click Setup on your Donor Pages App. This opens the main Donor Pages Setup screen. The URL for your public page is available on this screen, but do not share this link until you have completed all of your setup process, or the page will not work as intended. 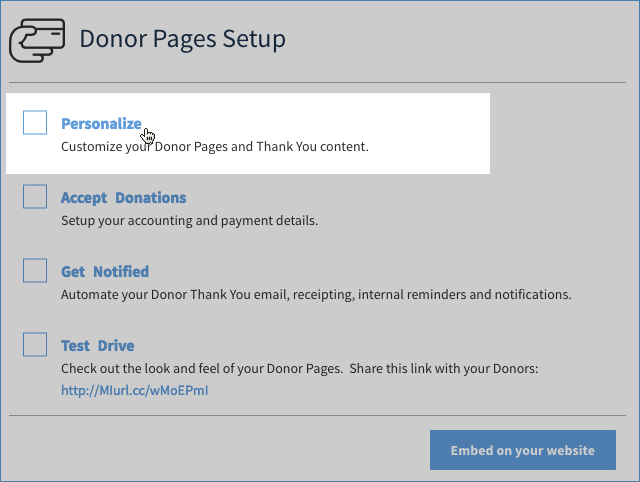 The first section, Personalize, lets you customize your Donor Pages and Thank You content. 2. This will open the Personalize screen. At the top, choose a Page Header Banner. This is the image you would like to appear at the head of your Donation page by clicking the + icon and either uploading an image or linking to a URL. Method supports JPEG or PNG formats with a maximum size of 400x150px. 3. Title your page in Page Title and include Header Text which will appear below it. 4. If you would like your donor to be able to donate anonymously, or to dedicate their donation to a specific individual or organization, check these options to enable them on the public page. 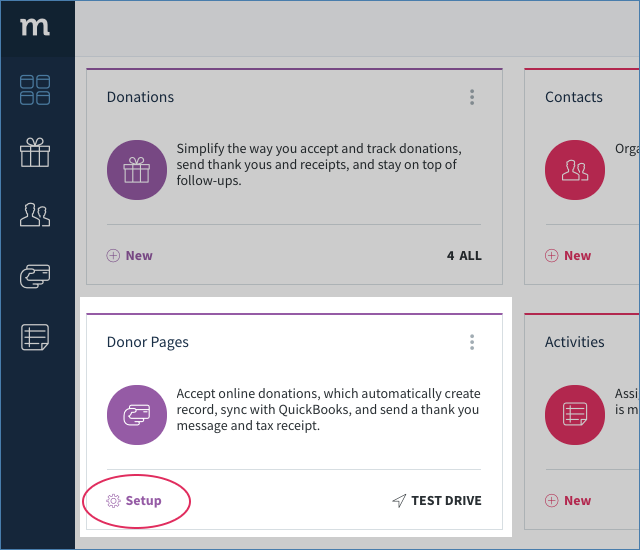 When donors choose the anonymous donation option, Method still captures their name and contact information, because donors must be synced by name to QuickBooks. This option is for informational purposes. However, donors who choose to be anonymous will appear as anonymous on public donor reports. 6. When a donor has completed filling out the public page and clicks Donate Now, they are redirected to a Thank You screen. 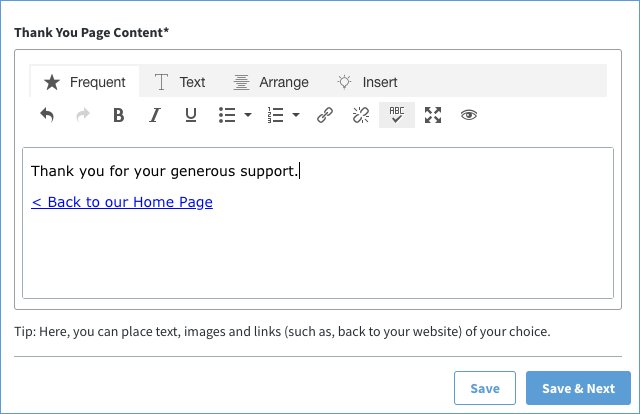 The Thank You Page Content allows you to customize that screen by including text, links and images in this section. When you're done, click Save & Next to save your changes and proceed to the next step of the setup process. Alternatively, you can click Save and return to your dashboard to Test Drive your donation and thank you pages.